Home Geophysics Pavlof Volcano eruption without earthquakes? Pavlof Volcano began a new eruption on March 27 with little advance warning. 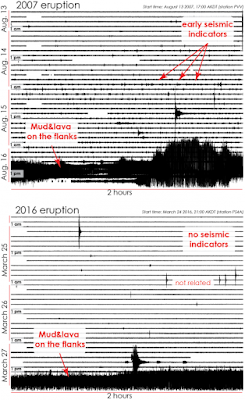 Many people have asked why there were no earthquakes in the days prior, or for that matter why the maps continue to show no earthquakes at Pavlof even though it is erupting. After all, aren’t precursory earthquakes one of the primary tools we use in forecasting eruptions? Pavlof is the odd, sneaky exception. Pavlof is among the most frequently erupting volcanoes in North America, with recent eruptions in 2014, 2007, and 1996. When it began erupting again on Sunday afternoon, it gave very little lead time, and as of yet has not produced a single earthquake large enough to be detected on its dedicated seismic network — the detection threshold is less than magnitude 1. Our partner organization, the Alaska Volcano Observatory, is busy tracking the activity with a variety of techniques, but so far earthquakes are not one of them. As I write, Pavlof still hasn’t even made it onto our Recent Volcano Seismicity chart. To understand this, first consider why earthquakes so commonly DO accompany eruptions. Moving magma and gas through solid rock is not easy. To get magma to the surface usually requires blasting open new cracks to serve as pathways. As magma begins to swell in the earth, many volcanoes will literally bloat. They may expand and begin to crack. Some of these cracks occur off to the sides to relieve pressure. Others occur under the edifice and allow magma to creep upward. Each of these fractures creates an earthquake. These processes create the hundreds or thousands of earthquakes that precede most eruptions. Sometimes these earthquakes begin months before an eruption. Sometimes the lead-time may be just hours. But Pavlof is a different beast. Pavlof is considered an “open system.” Its frequent eruptions and its style of magma are able to sometimes maintain a relatively open conduit system between eruptions. If the conduit doesn’t solidly freeze up after an eruption, then there is no need to clear out a new one. The mechanics of this are somewhat speculative but the data are pretty strong. By comparison, when Pavlof erupted in 2007, it had been quiet for more than a decade. Sure enough, the primary 2007 eruption was preceded by a day or two of early seismic indicators. It seems logical and plausible that more work was required to open the conduit that time. That doesn’t mean that Pavlof isn’t making noise. Pumping magma through the conduit and spattering out the top vibrates the ground continuously — think of hissing radiator pipes. This seismic tremor is a strong signal with plenty of telltale eruption signatures. Tracking this tremor is a great indicator of how eruptions are changing. Thus far, Pavlof has transitioned from continuous eruption early on, to shutting down for many hours, to erupting through short pulsating bursts. Who knows what the coming days hold. But once magma hits the surface, a lot of other observational techniques come into play. The atmospheric infrasound signature is clear hundreds of miles away. The satellite images of ash and hot ground are stunningly clear. And when weather permits, don’t underestimate the value of simple visual observations from the ground and air. Pavlof is not the only sneaky volcano. Shishaldin Volcano, about 90 miles to the west, often maintains a similarly open system and can ebb and flow without significant precursors. These volcanoes present a special monitoring challenge. Those of us in seismology relish the fact that, more often than not, we are the first to see the signs of a potential eruption. Volcanoes like Pavlof keep volcanologists humble. Note: The above post is reprinted from materials provided by Alaska Earthquake Center.